NARA M866. Journals of proceedings, early drafts, and other papers relating to the formation of the US Constitution. 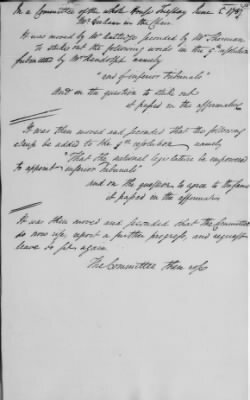 Convened in Philadelphia in May 1787, the Constitutional Convention created one of the most important documents of the new nation - the United States Constitution. Under this title you will also find Bankson's Journal, which includes the important delegate credentials from "Ratifications of the Constitution," and drafts of the Virginia Plan, which ultimately led to a bicameral Congress consisting of the House of Representatives and the Senate.